Thesurfingblog is dedicated to all things surfing.Nothing describes the soul idea of surfing better than traveling to new locations in the search of waves.We want to help you guys score great waves at great prices this summer.So we went out and did just that, we got you an amazing deal on an amazing trip. A deal you can ONLY find here at thesurfingblog. 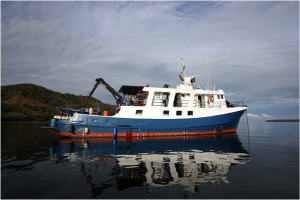 6 Days and 6 Nights in Panama on the 100’ Lost Coast Explorer for $1,500.This trip is valued at over $1,800.You aren’t going to find a deal this good anywhere else. Panama is one of the few surf destinations left where you can still score epic surf without the crowds.You can be guaranteed (yes GUARANTEED) that you will not surf with crowds.Not only will you not surf with crowds, you won’t surf with anyone but the people on the boat because The Lost Explorer is the only boat that takes surfers out to these waves.What also makes the Lost Coast Explorer package so great is that epic surf isn’t all you are going to experience on the trip.Here is a list of things included with your surf package. – The trip is for 6 days 6 nights.The Lost Explorer will take you throughout the islands of Coiba National Park and the Azuero Peninsula, giving you the option of several different surf spots. -We aren’t going to name off the surf spots because truthfully, you’ve never heard of them unless you have been on the trip. They are discovering new waves all the time (so maybe you can name a spot or two). As for the waves, there is something for everyone.If you want to surf a right point, they have one. If you want to surf a left barrel, they have one.If you want to surf a mellow wave, yes, they have one. The Lost Explorer can find any kind of wave you want within the National Park and just to remind you, you will surf without the crowds. This is not like an Indo boat trip where the lineup is flooded with boats and surfers. – While aboard you will have use of the 24’ boats. The boats can be used for many things. The best use of the boats is to get you to different surf breaks.When you want to get away from the main break the Lost Explorer is anchored at, you can take the boat to nearby breaks.This allows for the 16 people onboard to break off into different groups and have even less crowded surf. -Go fishing (Marlin, Tuna, Sailfish, Snapper, Rooster fish, etc. ), take you to private white sand beaches with umbrella and cooler provided, etc.These boats will give you a lot of freedom while out at sea. -Surf lessons and surfboards are available onboard.Even though they have boards it is recommended that you bring your own boards.The selection on the boat is limited and is available primarily for guests who break their own boards.If you want a board made by a local Panamanian shaper, let us know and we can work out the details. -When you aren’t shredding you can use the provided snorkel gear and spear guns for snorkeling and free diving.If you can spear some good fish they’ll cook it up for you too. -Experienced local and bilingual surf guides will ensure you score the best waves and have the best non-surfing experiences throughout your trip. -Also while you aren’t surfing the guides can take you on different tours.Tours include: Bird watching, Local villages, Abandoned historical prison and Jungle tours. -All the surfing you will be doing will work you up a good appetite.Luckily, gourmet meals and appetizers are provided along with complimentary beer and wine. You can eat inside in the dining area or out back on the large deck while watching the sunrise or set over the horizon. -When there isn’t a lot going on at night you can hang out in the onboard recreation room with card table and flat screen TV. -Lodging on board the Lost Explorer in one of the 8 suites. This is a surf trip/ Panamanian experience you’ll remember forever.You can be surfing epic/ un-crowded waves, fishing, snorkeling, relaxing, all while drinking all the beer you can handle this summer in Panama if you act quickly.We only have 2 packages available at this low discounted price and the offer only lasts for a limited time.Get ready for the surf trip of a lifetime.